After winning the first Stanley Cup in Los Angeles Kings franchise history, and the Conn Smythe Trophy for playoff MVP, goalie Jonathan Quick took his customary place at the podium for the postgame press conference. 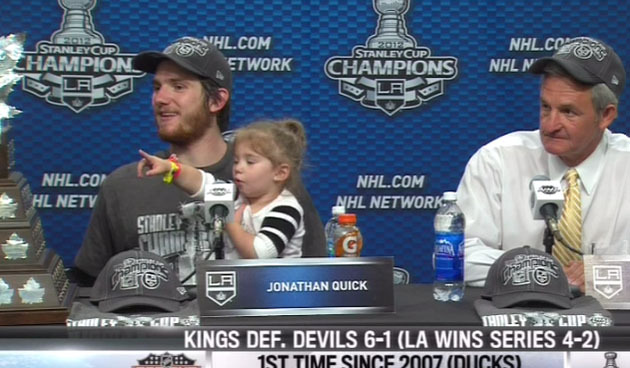 Also in the room: Madison, his 2-year-old daughter, who marched around with a Kings flag, took over the microphone at one point, caused some panic by choking on food and was generally the single most adorable thing we've seen in the NHL postseason. Glad the little one was OK after that choking bit. Quick's best save of the game? Pretty amazing that (a) a 2-year-old probably said more than Quick and Coach Darryl Sutter combined and (b) that Sutter managed to keep it together while an endearing moppet marched with a battle flag behind him.